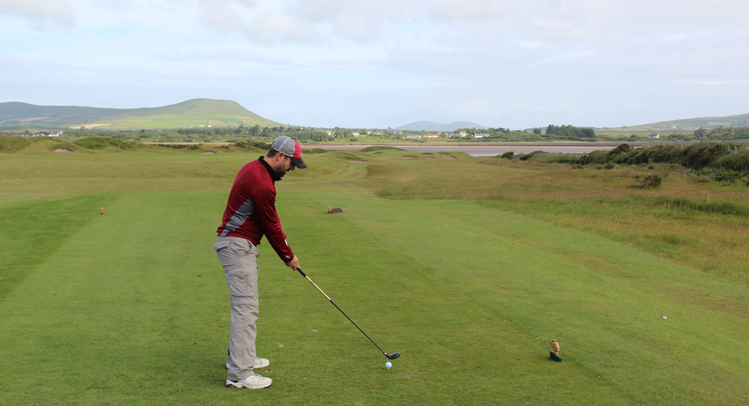 Looking for a different Ireland Golf Course Review? Waterville Golf Links Hole 2: The name of the first hole is "Last Easy", which is maybe not 100% true, but the 2nd certainly gives the golfer the impression that they are then in for a long day. At well over 400 yards from the back tees, there are also 11 bunkers on this hole, as well as a river down the right and a green complex with that hazard to the right and then behind the green as well. Waterville Golf Links Hole 3: The third hole is not any easier than the last with the sand or water (depending on tide) just right of the drive and second shots. There is also plenty of gorse and four bunkers down the left side of the drive to cause trouble. The bailout left of the green makes for tough chips with lots of undulations there and on the surface. Waterville Golf Links Hole 4: This par three has a really cool shot between sand dunes and the green itself has a few bunkers lurking around it to cause plenty of short game trouble. 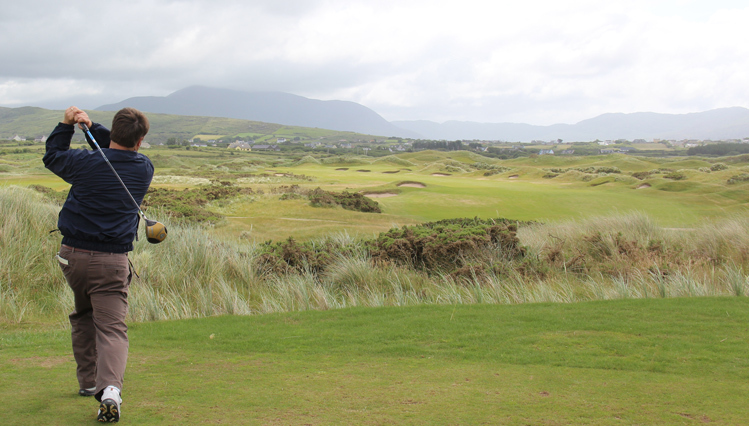 The tee is just elevated enough to give the golfer a really great view of the surrounding Ring of Kerry as well. Waterville Golf Links Hole 5: This slightly downhill par five is long and has just enough gorse around the fairway to cause some anxiety. Miss that, though, and it's one of the more docile holes on the course. Waterville Golf Links Hole 6: This nasty little par three has no good place (other than maybe just short of it and dead straight) to miss the green, which has distinct quadrants. Forget all of that and go dead-center to avoid the trouble elsewhere. Going right may find water so avoid that at all costs. Waterville Golf Links Hole 9: The third par four to finish the front nine is a slight dogleg right with plenty of bunkers to trouble the player on both shots. Avoid all of them to get par or better. 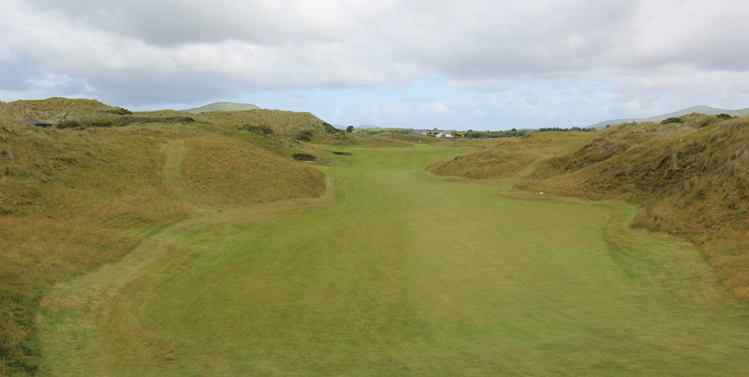 Waterville Golf Links Hole 10: The back nine starts with a beast of a par four highlighted by a shot up the "bottleneck" between two sand dunes with only about a 10 yard wide opening. 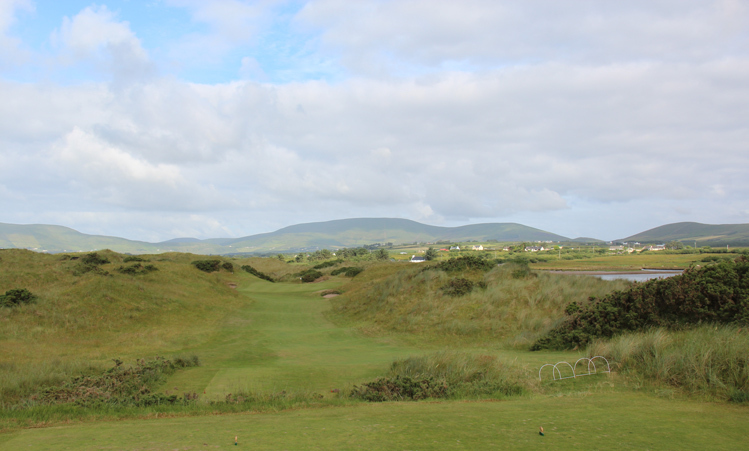 Waterville Golf Links Hole 11: This par five has dunes and undulations all over the place. The straight drive can actually make this a pretty good scoring opportunity however, as it is not long. Waterville Golf Links Hole 12: The "Mass Hole" is steeped in history and if the drive is not struck solidly, the player will get to get up and close with that history, which would be good to not do. Hitting a shot from down the hill will make the player feel like a real "masshole". Sorry, could not resist the temptation! Waterville Golf Links Hole 13: A solid drive here, especially one over the bunkers can open up the best birdie opportunity on the course, as this par five is downhill and short. The four bunkers short and left of the green can spell trouble though, but all things equal, this is a player's breather on the back nine. 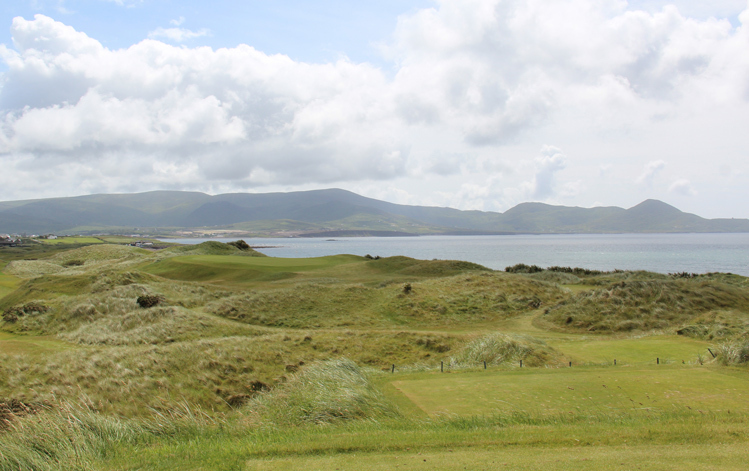 Waterville Golf Links Hole 16: This is a shorter par four in a stunning location between dunes and the beach. Going left is a disaster as the dunes are huge and the grass thick. Right is no better though as the ball will be on the beach or rocks. The green is kidney bean shaped and deep. 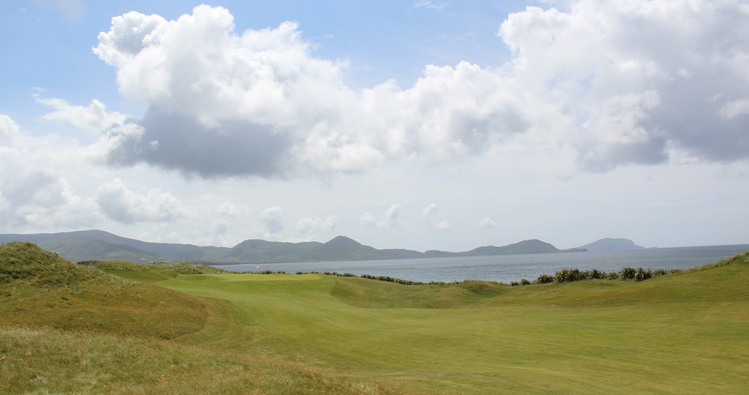 Waterville Golf Links Hole 17: Great ocean views greet the golfer here, but anything left of the green will be greeted by an unfriendly bounce down the hill and a nasty chip. Shots just right of the green may hop back left onto the putting surface. 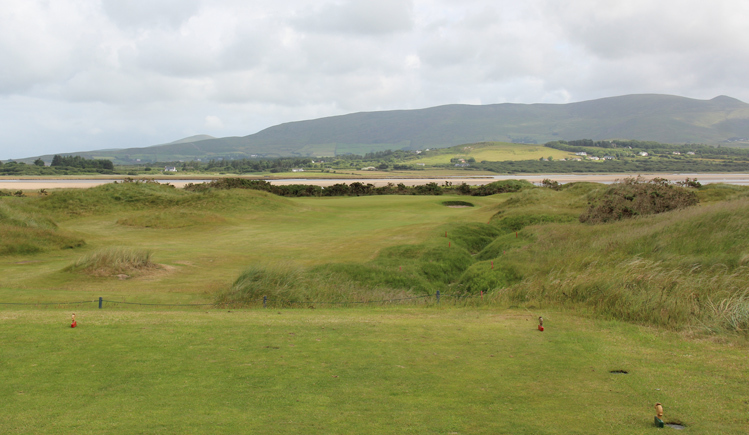 Waterville Golf Links Hole 18: Dead straight, long and narrow, this finishing par five is tough as there is rocks and ocean right and unforgiving rough, dunes and bunkers to the left. The view from the tee is top notch, but the golfer's shots will need to be so as well to get par.